Pond Maintenance VISIT OUR SHOWROOM! 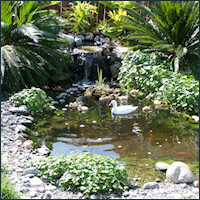 We offer a full service lake and pond maintenance division that serves customers all over Southern California. Our main areas of service are detailed below. If you would like to find out more, or receive a quote for service, please give us a call. This service is designed for the homeowner who enjoys his or her pond, but doesn't quite have the time to maintain it or just would like not to have to deal with the maintenance aspect of their water feature. This is where we come in. We will be more than happy to accommodate you by maintaining a well-balanced eco-system for you whether you need us once a month or once a year. Any additional product needed will be an added cost. Schedule of service visits: monthly, every other month, twice a year or once a year.